While John and I don’t agree on all food choices (he hates sweet potatoes, but they’re my only love), we do agree that ramen is where it’s at and frequently seek it out for dinner – especially in the fall and winter. I love how savory and comforting it is, and how amazingly full I get on broth, rice noodles and vegetables. It’s magic. I loved making vegan ramen last year and wanted to try it again. But this time, the broth was inspired by our go-to Portland ramen shop, Boxer Ramen. Their vegetarian broth is insanely delicious and has a unique flavor profile. Although I was skeptical at first, the coconut curry infusion just makes sense. It adds a whole other dimension to the broth – warmth, spice, slight sweetness. I’m in love. Consider this my inspired version that requires just 10 ingredients and roughly 1 hour to make. This would make a delicious and comforting meal when you’re craving something light yet satisfying. The toppings and noodles are extremely versatile, so everyone can pick and choose how to style their bowls. This would be delicious on its own or paired with my 20-minute Asian Kale Salad or even these Spring Rolls with Cashew Butter Dipping Sauce. Dream big and eat ramen (new life motto). 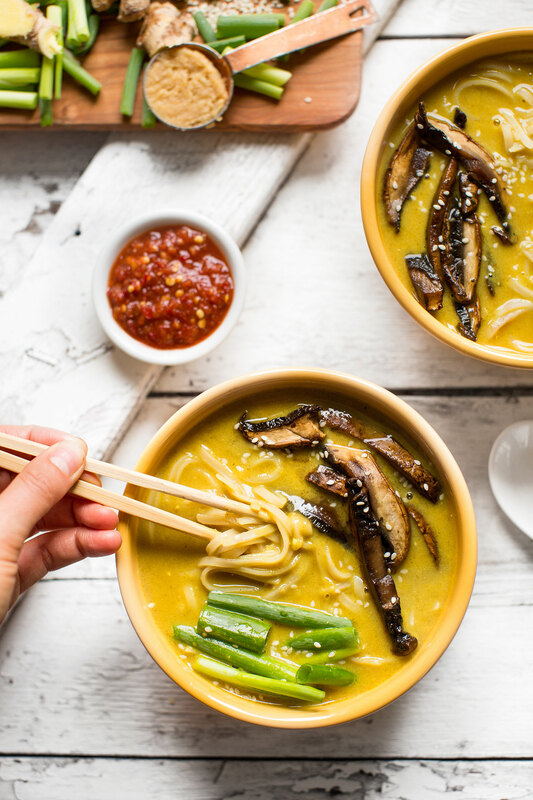 Savory vegan ramen infused with curry and coconut milk. 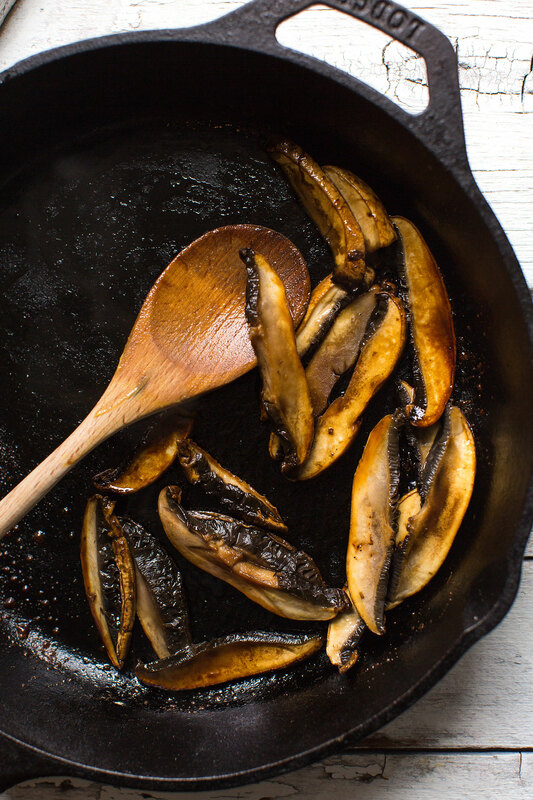 Serve with sautéed portobello mushrooms and gluten-free noodles for the ultimate plant-based meal. Heat a large pot over medium-high heat. Once hot, add oil, garlic, ginger, and onion. Sauté, stirring occasionally for 5-8 minutes or until the onion has developed a slight sear (browned edges). Add curry paste and sauté for 1-2 minutes more, stirring frequently. Then add vegetable broth and coconut milk and stir to deglaze the bottom of the pan. 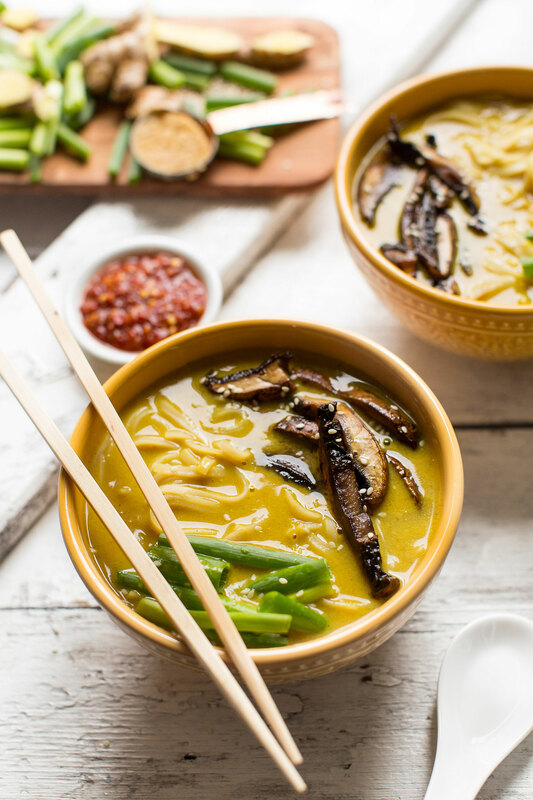 Taste broth and adjust seasonings as needed, adding coconut sugar for a little sweetness, turmeric for more intense curry flavor, or more sesame oil for nuttiness. About 10 minutes before serving, prepare any desired toppings/sides, such as noodles, sautéed portobello mushrooms, or green onion (optional). Just before serving, scoop out 1/2 cup of the broth and whisk in the miso paste. Once fully dissolved, add back to the pot and turn off the heat. Stir to combine. Either strain broth through a fine mesh strainer (discard onions and ginger or add back to the soup) or ladle out the broth and leave the onions and mushrooms behind. To serve, divide noodles of choice between serving bowls. Top with broth and desired toppings. Serve with chili garlic sauce or sriracha for added heat. Best when fresh, though the broth can be stored (separate from sides/toppings) in the refrigerator for up to 5 days or in the freezer for up to 1 month. *You can sub sesame oil for coconut, but the sesame adds a nice rich nutty flavor to the ramen that I prefer. *Nutrition information is a rough estimate calculated using brown rice noodles and mushrooms with no additional toppings. *If using ramen noodles, this recipe would not be gluten free. I have the great fortune to live near Portland and know, firsthand, how awesome Boxer Ramen Coconut Curry Ramen is! I was very excited to find this recipe, I wanted to surprise my vegetarian & vegan daughters with a care package of their own! 1.) Be careful sauteing the onions, ginger, and garlic. Medium-high on my stove was hot enough to scorch the garlic despite constant stirring… and it haunts my broth. 2.) I used yellow curry paste. It was redder than the photo above, and too hot! I would have liked to know what brand Minimalist Baker used/recommends. Same with the miso. 3.) I would have liked suggestions on how much coconut sugar/turmeric/sesame oil to add when adjusting the seasonings. I couldn’t quite figure out how to get the deep, round, umami flavor out of my broth that I love at Boxer Ramen. 4.) The mushroom part of the recipe was outrageously good! Wow… don’t skip those! 5.) I added other toppings that I enjoy on ramen… a jammy egg, some shredded chicken, and a chinese pickled radish condiment I like. It turned out gorgeous… I wish I could post a photo! it just wasn’t quite Boxer-tasting enough this try. But I’ll try again. I’ve never used curry paste- is this dish very spicy and how can I make it suitable for a child? He adores ramen and I really want to make him something that’s flavoursome but unfortunately not spicy as he can’t handle that! 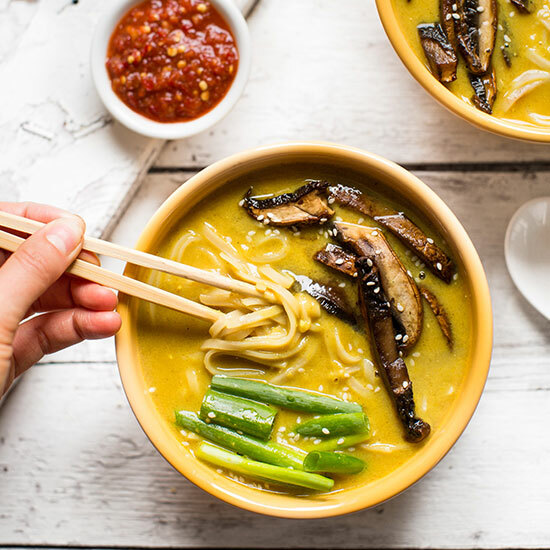 This is absolutely delicious – perfectly flavored like my favorite yellow curry at Thai restaurants! I followed the recipe closely, but the only mushrooms I had on hand were maitake, which were delicious when sauteed in soy sauce and used as the topper at the end. The flavor and aroma of this soup is divine. The pho rice noddles I used were a good choice. My adjustments for next time will be to add in some onions and carrots about 30 minutes into the simmer schedule. Because of the long simmering, the existing onions almost disintegrate by serving time (which I’m sure is intentional), and I would love to have some veggie chunks in the soup. This was the first I have used and even purchased miso and curry pastes, so it was a fun experiment, and definitely not steps to skip in order to get this flavor right. As a long time follower and user of this blog, I am again very impressed! This recipe will be added into my regular rotation. :) Thank you, Dana! 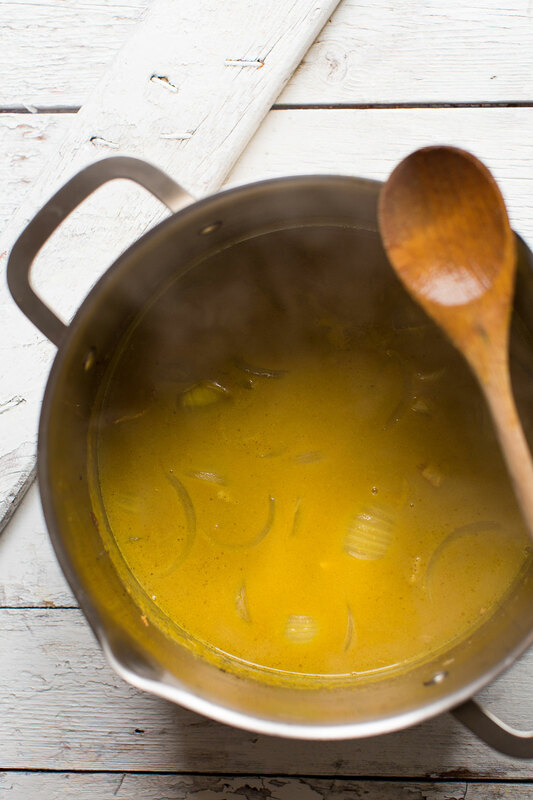 This broth is such a great base! It made way more than 4 servings for me, probably around 8. Once the mushrooms ran out, I ended up sautéing some tofu & edamame which was equally delicious. Whenever i need something above all other – you provide it!! So kind! We’re glad you enjoyed the recipe, Janet! Hello, i plan on making this dish tonight and making my own ramen noodles (i have the ingredients and the machine). Should i cook the noodles apart and add the to the broth or just add them to the broth uncooked? Hi! I would probably just cook them in the broth! Thank you! I absolutely LOVE all your recipes! It is rare for me to prepare recipes I find online because many GOOD vegan recipes contain ingredients that are difficult for me to find in Mexico. Of the few that I have made have been of your site (vegan fried rice is my favorite! ), since they have few ingredients is not so overwhelming to try to get each one of them. I also love the format in which you present the recipes, thank you for that. I just noticed that in your recipes you include the nutritional value and, I do not know if this interests you but, I think it would be cool if you append your recipes to the MyFitnessPal application. I’m not sure if that would help you have more scope, but hey, just an idea. I just made this (yes, in the dead of summer) and it was delicious. Here’s what I did differently: I followed the recipe but sauteed the ingredients in the pot of my instant pot using the “saute” function. I added the broth and milk and slow cooked everything all day. I made the mushrooms without the maple sryup, as I’m trying to reduce my sugar intake. My husband and I both said we wished we had more mushrooms, so if you like mushrooms, I would recommend doubling or even tripling the batch (we love mushrooms). I topped mine with the mushrooms and steamed broccoli and plan to add some roasted tofu next time. This will definitely go in my family’s dinner rotation. It was easy, delicious, and a great combination of flavors and cuisines. Thanks for sharing your recipe changes, Kaitlan! We are glad to hear you enjoyed it! This is one of my most go-to recipes! I always pair it with baked tofu and sauteed mushrooms with wholewheat noodles and oh man! I always grate the ginger and garlic in so that I don’t have to bother scooping it out at the end and I also use fresh turmeric which I grate in at the beginning with the garlic, onion and ginger too, which is really delicious! Oh… plus 100% buckwheat ramen noodles kept it gluten free and stayed firm! I made this using red thai curry paste, cabbage, shitake/cremini/oyster mushroom blend, tofu and spinach! I couldn’t throw in enough ingredients! So gooooood!!!! Yay! Thanks for sharing your additions, Felicia! This recipes looks amazing! However, my husband cannot have a lot of sodium due to heart health. If I sub water for the vegetable broth will it take away from the taste? If so, any other alternatives? ? Hi Cheryl! I would recommend cutting the broth in half but not removing entirely as much of the flavor is held in the broth. Hope this helps! This is my new favorite weeknight recipe! I actually use a carton of miso soup broth instead of veggie broth and miso paste to make it even easier, and I love adding some tofu or extra veggies! This was so delicious ! I wasn’t sure if my bf would like it, but he loved it! The flavors all blend together fantastically. Thank you ! I have made this like 3 times in the past two weeks because it is absolutely INCREDIBLE. I’ve shared it with as many people as possible so they can bask in the heaven that is this ramen. It’s also my go-to meal to make when we have friends over and want to blow their minds. It’s just perfect, so thank you times a million for bringing this into my life. WARNING: Restaraunt ramen will no longer be as impressive unless you go to Japan (maybe). This is SO good. Easy to make, too. This was so good, and I’m so happy I tried this. If I could give it 6 stars, I would! I’ve made this twice since I didn’t get enough leftovers out of the first batch. The second time around, I minced the garlic and ginger and left it in for added flavor. I also added corn and chili garlic sauce to the green onion and mushrooms as toppings. hey there! quick question: what would you use to replace the coconut milk and the miso paste? if there anything close to replace this amazing foods…husband cant eat them at the moment lol. This is really yummy and comes together quickly! Thank you for providing simple, healthy, and tasty recipes. My boyfriend and I made this recipe last night – it was good! We were able to let the broth simmer for about 2 hours and added radish and topped it with a little cilantro, but we felt it was a little bit salty for us and might try unsalted vegetable broth next time. I’ve made this so many times, I can’t even tell you how many times, and it always hits the spot for my husband and me. So easy and so addictive. Made this and loved it. Added cubed tofu, baked until crispy in advance, and bokchoy. Also added lime juice and fresh cilantro right before serving. I omitted the miso because the curry paste I used had salt in it and didn’t want it getting any saltier, but it didn’t lack in umami even with this omission. Delicious! In the future, I want to try adding bamboo shoots and different kinds of edible fungus (I think these would soak up the wonderful broth in a delightful way). Hi! We don’t have that option, but you could save it to your favourites in your browser! I made this two nights ago, using Thai and True’s green curry paste and added baby spinach and zucchini noodles (in place of actual noodles). I just had my first bowl – I was worried that the broth would be bland but, let me tell you, this was DELICIOUS! This is by far one of the tastiest things I’ve made. I think next time I’ll add bamboo shoots and snow peas. Thanks so much for this amazing recipe, Dana! Made this last night. The recipe worked really well for me. Then I did a variation with kelp noodels and lots of sprouts that was awesome too. Thank you for a quick and easy recipe that works! I just finished making the broth and THOUGHT I followed the recipe exactly. It’s too spicy to eat. And I love heat and curry. Is there a difference in yellow and green curry paste? (I used green). Maybe I used too much ginger? What could have given the broth so much heat? I never added tumeric. Is there any way to tame the heat at this point? I’m not giving up. I’m an accomplished cook and recognize a good recipe when I read it. I just need to figure out where I went wrong. Obviously a very belated reply, but the heat is coming entirely from your curry paste. Spice levels vary widely from one paste to another, but it is standard for green to be quite spicy; the first ingredient is normally green chilis (hence the color). You may have totally followed the recipe (and the recipe is great) but the paste you’re using is too hot for your tastes. The only way to remedy an overly spicy dish that I know of is to follow the “solution to pollution is dilution” rule: add another can of coconut milk and more stock, then tinker with all non-paste seasonings till you get things in balance. I made this for lunch today, and it was exquisite. I served it over rice, since the noodles I thought I had in the pantry were nowhere to be found. Topped it with crispy tofu, and everyone licked their bowls. Next time I think I will use full fat coconut milk for a bit of creamier texture, but I am sure that all boils down to personal preference (literally). Holy freaking crap. I can’t stop craving this! Made it last night for dinner, and leftovers for lunch today…I almost contemplated making it tonight for dinner again but that might make me a little crazy?! Anyway, thanks! The sesame oil makes everything taste aaaamazing! Quick question since I get the feeling I will be putting this on the menu for this week: Is there a way that I could use my curry powder instead of buying curry paste? If so, how much should I use and when should I add it? If that won’t work, no big! Hi Rachel! It looks like one other person has tried it and had success with using curry powder instead of curry paste. They used about the same amount as the paste. I would add it at the same time! Can’t wait to try! Boxer Ramen’s veggie ramen is my absolute favorite. This was so delicious! I used man fun noodles (or rice noodles) for the actual soup. I also used minced ginger instead of slivers. Overall it is so good, it is becoming a staple in our house! Thank you for this awesome recipe! Yummy!!! I squirted some Braggs in my bowl but just one good squirt. I added avocado and did the mushrooms. SO GOOD. Worth the hour ? Omg, this was so good. Tasted just like the horrific top ramen I used to eat only so much more fresh and delicious. I opted for zucchini noodles and didn’t strain the onions. Another note I fried the portobello mushroom as instructed for my bf though I do NOT like mushrooms. I gave it a try and this was the FIRST time in my life I actually thought mushrooms were “good.” My son and boyfriend loved this. I absolutely love this recipe–I’ve made it twice since discovering it. However, each time I make it I’m left with very little actual broth…is there something I’m doing wrong? I keep the heat very low, just enough to barely simmer, and leave it cooking for 2 hours. Is this normal/happening for anyone else? Such a disappointment to use a whole box of stock and see the small amount of broth left over. Hi Elena! It sounds like the broth is cooking down too much in the 2 hours you’ve got it on the stove top. Maybe try a lower cook-time? Hope this helps! I only have red miso. Can I still use it in this? Hello! I just wanted to make sure that it was in fact Thai curry paste that you used and not an Indian curry paste. I only have Thai red curry paste and was hoping to use that. Thanks! Yeah the recipe uses Thai curry paste. Thank you for sharing this recipe, I just did it and it tastes very good. I did not have mushrooms and fresh green onion, but I had some chickpeas and I steamed some pumpkin and green beans and I added them to the soup and the ramen and I can say that the whole was good. I just came across to this and I wanna make it for dinner tonight but I don’t have coconut sugar and both pastes. The only one I got is red curry paste can I sub with that? Made this the other week and it was absolutely delightful. I sautéed cubes of tofu with the mushrooms, it was so good. Looking forward to make this again! thanks! If you wanted to add meat to it, is their a certain type you would recommend? Thanks! Can’t wait to try this recipe tonight! Hi! Maybe chicken? Good luck! I’m sitting down with a bowl of ramen as I type. I topped it with serranos, chives (they were turning, so I thought why not? ), green onions and of course the mushrooms. Cilantro would be a nice addition too. Hmm, perhaps tomorrow. This is excellent. You never disappoint! Thank you for the ingenuity in the kitchen. I usually cook for only myself, but anytime I’m visiting my Mom and Jack or other family/friends, they jest about the concoctions I recreate, but are always blown away when they actually try it. My kudos to the chef, Dana. Sorry if this was addressed already-can I just use curry powder if I don’t have curry paste? Hi! I would have to say that they really are not interchangeable! If you do try it though, let me know how it goes! I made this using only curry powder in about the same amount as Dana used the curry paste. Turned out amazing still! This looks delicious! Do you think it could be done in a slow cooker (3 hours)? I’d say 1 hour on high, 3-4 on low? This was one of the best things I have ever made! Thank you! I used red curry paste (it was already opened) and chicken broth (I’m not vegetarian; it was what I had) but otherwise followed the broth recipe. I did use the turmeric and some powdered curry but omitted the coconut sugar, didn’t have any! I made the mushrooms, too with equal parts maple syrup, siracha, sesame oil and rice wine vinegar and threw it in the toaster oven at 400 for 30 min…then I had to sautée it anyway because it made too much liquid. Ah well, not everything works like you think it will. I also used “Banh pho” noodles, soaked them in cold water for around 30 minutes and then threw them into the broth and let it simmer for a minute or two. So much yum! Those noodles sucked up all that delicious flavor. Thanks again for a great recipe that was easy to follow and lays an awesome base you can add a personal creative spin to! Hi. My daughter and I loved the recipe! Do you think the broth would freeze well? I’m looking for easy ideas for my daughter to put together a quick a delicious vegan meal since she is always on the run. Hmm, I think so but I’m not sure! Let me know if you try it! This was dinner today. AMAZING!! I have tried several ramen recipes and this is the best! I just made and ate this with my husband and it was DELICIOUS. i added portobello mushrooms and noodles to mine. I also left in the garlic, ginger and onion. Can’t wait to make it again! Just made this tonight and holy moly it’s good – perfect for cold and flu season. Next time I’m going to double the broth and freeze half. I used green curry paste which was delicious but not near as attractive as the pics above. I’ll search for yellow paste. Thanks for the lovely dinner! The vegan ramen at Boxer is the best. Thanks for the recipe! This was delicious and simple. My husband said, “I hit it out of the park”, with this one. ???? I found gluten free ramen noodles at Whole Foods. I will definitely be making this again! Thanks! I read this recipe and knew where to go on my recent work trip to Portland. Lucky for me Boxer Ramen was right down the street and I had the veggie coconut curry. It was so good. I don’t know what they put in that broth to make it so delicious. I ate way more of it than I probably should have. Now I’m even more inspired to make it at home! Thanks for the recipe and the restaurant recommendation. I used spiralized zucchini and was pleasantly surprised how well the noodles held up. Totally forgot the ginger, but the soup was still warm and amazing. It really hit the spot. Thank you. I’m new here…do you pre cook the zucchini noodles or just add to hot broth? I just add the hot broth, no need to pre cook. The noodles will still have a slight crunch this way, and you’ll be able to slurp them! Mine turned out a brownish color and not yellow at all. What did I do wrong? Hmm, could be the curry paste you used? Next time add turmeric for more vibrant yellow color! My husband is out of town, so I was making dinner for myself and a picky eater (my son). He ate two bowls! It had the perfect amount of spiciness and great texture + flavor. I added a dash of salt and turmeric, but otherwise it didn’t need much adjusting. I served it with sriracha and chopped green onion. This one is going in the recipe book! Amazing recipe! A very interesting combination of ethnic flavors, it reminds me of our coconut lime noodle soup. Delicious! Brown rice spaghetti worked for the noodles. It was a bit more spicy than I usually like, but since we’re fighting colds, in this case it was fine. I’ll probably use a little less chili paste next time. I only had time to let the broth cook about 40 minutes, so I will definitely make it again to see what the longer time does. Great recipe – combines so many of my favorites! Just perfect for a grey dreary cloudy day – so many of those!! Thank you! WOW! The mushrooms and green onion definitely add a little extra zing. I would have like it a bit thicker (simmer without lid on? ), but the flavor was excellent! Husband’s comment: this’ll be great on a cold, winter day! So 2 thumbs up, 5 stars, and numerous kudos! Thanks for sharing this great recipe! It’s on the stove and smells great. I’m about to saute the mushrooms and cook the noodles. BUT, the directions still have an error: “Either strain broth through a fine mesh strainer (discard onions and ginger or add back to the soup), or ladle out the broth and leave the onions and mushrooms behind.” ….leave the mushrooms behind…” ? I’ll let you know how it comes out! I did this recipe yesterday and it was delicious, although I did the mistake to use low sodium vegetable broth and I had to add additional salt to the broth. I have one question, is it possible to find vegan Miso paste? The only one I could find was at Walmart and it contains fish. Yes! I like this one that’s vegan friendly. I get mine at Whole Foods or it’s available online. Insanely good flavor and so comforting. You’ve done it again, Dana! Thanks for the amazing recipe. What a treat! SOOOOOO much better than the boxed variety. Coconut curry is the best! Hi! Pardon my ignorance here – when you have mentioned the different types of noodles we can use and the ramen clicks through to another link – do we follow this recipe entirely for the ramen noodles – so it would end up being approx 20 ingredients all up – or are u just referencing the brand of ramen and amount – so buy, boil and add as per this recipe? So sorry for the silly question, but I honestly have no idea. Thanks so much! Sorry for the confusion! I’ll amend that. I just mean those brand of ramen noodles I linked to there. I’ll fix it! Dana, I used wheat ramen and it absorbed ALL of the yummy liquid. It became a very lovely noodle dish, but I want to know what noodles you used so that I can have a lovely noodle soup instead. Also, the mushrooms were fantastic, what a great addition! Hi! I used pad thai noodles. This recipe turned out well. The two grocery stores I went to didn’t carry miso paste, but I did find boxed (vegan) miso broth hidden within one store’s broths/stocks section. So instead of using a full carton of vegetable broth for this recipe, I used half that and half miso broth. At first I wished I used full fat coconut milk instead of light, but because I let the soup simmer for so long, it ended up reducing a lot and became the perfect consistency. I left in the onions, garlic, and ginger for texture, used curly ramen noodles, and added extra turmeric. Instead of mushrooms, I sautéed red bells and (lightly baked) tofu with soy sauce and sesame oil. I also added in a few fix-ins, like scallions, raw spinach, avocado, garlic chili sauce, and black sesame seeds. Thank you so much for your reply! I wound up using a red curry paste and also tossed in a sprinkle of dry curry as well. You delivered yet another 5-star recipe. My husband and I just finished and it was so flavorful and delish. We kept all of the goodies in the broth for added flavor and did add in the turmeric as well as green onion and portabellas that you suggested for the toppings. Thank-you for sharing this awesome dish! I made this last night, and it was delicious! I didn’t have time to simmer the broth for more than an hour, but it still came out well. I also sautéed some red peppers with the portobello mushrooms, which added some nice flavor/texture to the dish. (Your suggestion of sautéing the mushrooms in sesame oil, soy sauce, and maple syrup was AMAZING, by the way! This will be my go-to trick from now on!) For the noodles, I used brown rice ramen noodles, which were okay, but ended up being a little too mushy. Next time, I’m going to try to find regular ramen noodles, or use wide (pad thai style) rice noodles. Besides those modifications, everything came out scrumptious! Thank you so much for posting this recipe! I can’t wait to make it again! Made this a couple nights ago. My boyfriend and I are fans! I think the sauteed portobello mushrooms complemented the curry broth very well. I also added a soft boiled egg for some extra substance. Next time I will add some veggies too. Thank you for the recipe! Hi! So a couple questions.. Can I sub dry curry spice mix in lieu of the curry paste? And what type of noodles are pictured here? They look amazing and waaaay heartier than traditional ramen noodles (the thin crimpy-looking kind). Thanks so much! I can’t WAIT to make this.. I just know it’s going to be amazing. You da best. Hi Janet! These are pad thai rice noodles, but ramen noodles are still my favorite! Also, curry paste will give you a way better flavor, but you could try a dry mix! Let me know how it goes. I just made this, and it was delicious! I got a bit lost on step 7 though. Strain the onions and mushrooms… when did we add in the mushrooms? Why would we want to strain them out? I did strain out the onions, garlic and ginger sticks… then added sauteed mushrooms to the bowls with noodles, poured broth over and had a feast. Thank you! Rather than mushrooms do you mean ginger and garlic when you say to discard? Fixed! I meant onions + ginger, not mushrooms. Sorry for the confusion! That’s been amended! I meant onions and ginger – sorry for the confusion! Wow, I cannot wait to make this recipe tonight! I especially love it because I have all the ingredients on hand, which is NOT usually the case for ramen recipes I see. My husband doesn’t do mushrooms (and I don’t have them on hand anyway), so I’ll be subbing those out for tofu. Because the kale in my garden is currently going nuts, I’ll probably throw some kale in there too. Thank you for doing my meal planning for me! This looks delicious! Can I substitute curry powder for the paste & about how much would I use? I could eat so much of this! Yum, what a great way to eat ramen! Ramen is ev-er-y-thing. I’ve never thought to make a coconut curry version though, it sounds lovely! I was wondering if there is something I could substitute the coconut milk for? Hmm, just vegetable broth I suppose. What about plain soy milk? That would add some creaminess without changing the taste too much. That will change the flavor a lot. I wouldn’t recommend that! This recipe looks yummy! Would be perfect for the season. Only thing is I don’t eat legumes so can’t use the miso paste (it’s soy based). Anything I can substitute? Thanks Dana!!! Hmm, that’s hard! What about coconut aminos? Or, you could try adding chili garlic sauce/paste for more flavor. Good luck! Good idea with the chili garlic sauce! I’ll have to try and report back. Thank you!! Wow this looks SO delicious! So cozy and warming for wintertime :) Thanks for sharing! I made this last night, and it was so good! I was able to let it sit on the stove for 2 + hours, so leftovers should be even better :) Super versatile too (I ended up adding red cabbage and bell pepper). Also, I would say it kind of desperately needed a hit of acid…so i used up one of the cut lemons I had in my fridge. Thanks for the easy and oh-so-comforting recipe! Thanks for sharing! Lemon is such a nice addition – thanks for the tip! We visited Vienna last year! Such a beautiful city. Enjoy! This looks like the perfect thing to make on a dreary day like today. Do you think it would work with red curry paste instead of yellow or green? I do! That will lend more spice and a slightly different flavor, but yes it should work! Yes! Udon would work! Good luck. That broth alone looks drinkable! Such a gorgeous bowl of soup! Thank you. I’m going to definitely try this recipe because my wife & I love all things ramen & since we’re both foodies living in Portland we’re definitely going to try Boxers. First of all, this recipe is going into my must-make list! Second… Your husband doesn’t like sweet potatoes?? I guess I can’t judge too much, my husband doesn’t like bell peppers or chia seeds! Silly men. Ha! Yeah, he’s only a white potato kind of guy. But he’s very adventurous otherwise! Hi, loving your blog and your book, especially as a fellow Portland dweller. Quick question – what would you sub if you did not like mushrooms for a more filling meal? Thanks! Hmm, how about tofu? Or, edamame? I added red bell pepper and tofu! You never ever fail me. Thank you!!!!! yassss! I’ve been wanting to try ramen for ages! Everyone says Portland has some really good ramen – now i know where to go and how to make it at home! thanks! Yes! Boxer is where it’s at! I totally get you on the tea and soup cravings, although my go-to for winter will always be pea and mint (unusual, I know!). Okay, I would never think to make this on my own. Like never. And it looks absolutely scrumptious. I love the ginger in this recipe, lately, I’m needing lots of ginger to make my life go smoother these days. And the coconut is lovely too!